In the nearsighted eye, its components are not precisely in tune. 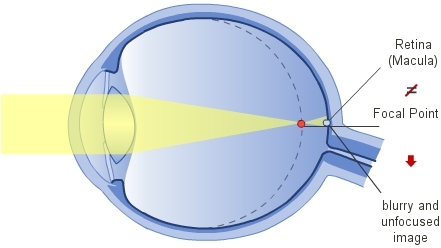 The refractive power of the cornea (the outer layer) is too high (or the eye is too long) causing light rays to focus in front of rather than directly on the retina. This results in unfocused and blurry vision. However, a nearsighted person is able to see close images very sharply because the light rays from these near objects are bundled on the retina. SMILE -3 up to -8 dpt. Femto-LASIK (individual LASIK) up to -5 dpt. PRK / LASEK up to -6 dpt. Phake Linsen (phake IOL) -1 up to -23,5 dpt.